A versatile pair of 4 wing cutters which will produce either a 4mm or 6mm tongue, depending on which way they are mounted on the arbor. 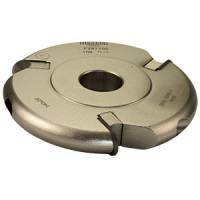 The cutters may be used in conjunction with 4mm or 6mm groovers, and the width of the tongue is set by the position of the router fence. 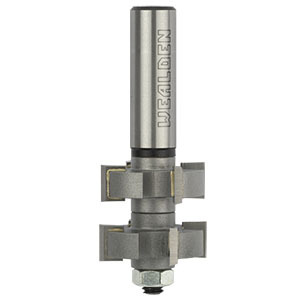 Cutters are available in pairs, mounted on an arbor and, in addition, complete sets including both 4mm and 6mm groovers are available at a cost saving over the individual prices. PLEASE NOTE: This cutter is not available in a 1/4" shank version. ASSEMBLY comprises: Pair of cutters and arbor. 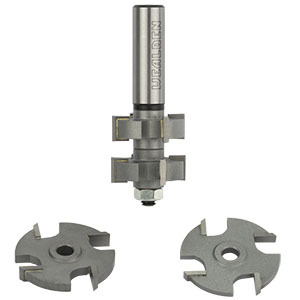 SET comprises: Pair of cutters, arbor, 6mm groover, 4mm groover and a set of spacers.